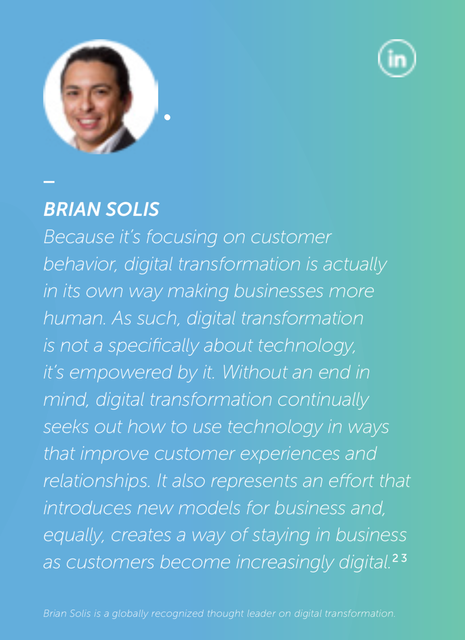 Brian raises an interesting point that digital transformation isn't about digital. Digital after all is about IT, Cloud, SaaS or whatever the IT department does. Transformation is about the people and the process. New ways of working, greater efficiency, being more effective, having the right capability to drive the company forward in a digital and social world. Too many projects are hijacked by IT, where there is I'm sure, cost savings, and a shiny new IT system. Which is bit like digging up a road and laying new tarmac. You still go from A to B, but gain nothing. Digital transformation is afterall about social, the people and the process, without whom there will be little or no business benefit. As such, digital transformation is not or should not be about digital. It’s greatest potential is achieved when technology enables human-centered experiences and the change that comes about inside and outside the organization as a result.